Take a close look back at the Grizzlies matchup against the Pistons in Detroit. Delon Wright drops 15 points on Tuesday night against the Pistons. Bruno Caboclo had 15 points, 3 rebounds, and 2 assists in the Grizzlies’ road game in Detroit. Watch Tyler Dorsey lays it up and in over two defenders. Jevon Carter banks it in from beyond the arc in the second quarter against the Detroit. 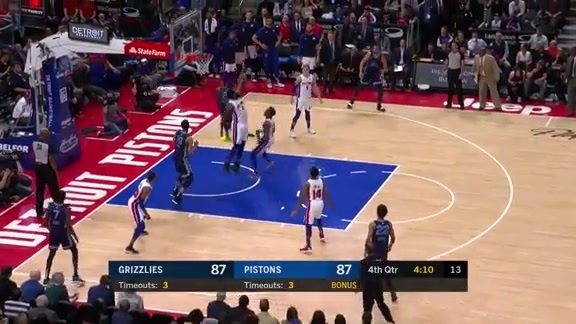 Ivan Rabb finds Justin Holiday who knocks down the three in the second quarter against the Pistons. The Pistons were down 19 at halftime, and the comeback win saw the Pistons overcome its largest halftime deficit since being down 23 at the intermission in a victory over the Seattle Supersonics in 1988-89. Detroit’s biggest lead of the game was seven (100-93) and Memphis’ biggest advantage was 22 (28-50). There were four lead changes and five ties in the game. 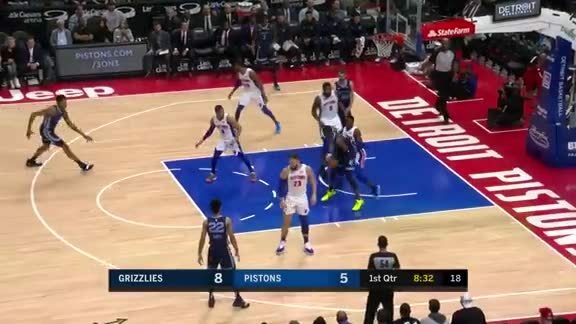 The Memphis Grizzlies surrendered a 15-point lead in the fourth quarter as they fell to the Detroit Pistons, 100-93, on Tuesday night in Little Caesers Arena. The Grizzlies dropped to 32-49 on the season and 12-29 on the road. The Pistons improved to 40-41 on the year and are now 26-15 at home. Detroit swept the season series 2-0, marking their first sweep against Memphis since the 2007-08 season. 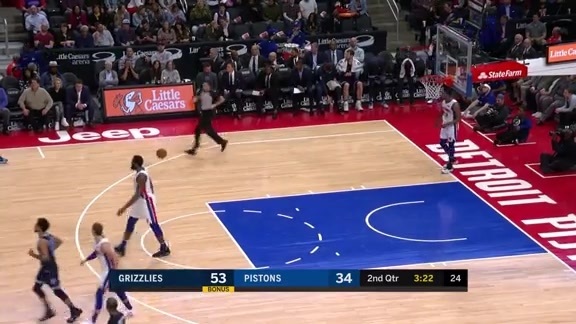 The Grizzlies committed 22 turnovers in the game, the second-highest amount of turnovers in a game this season, while the Pistons turned it over nine times. Detroit used that +13 margin to outscore Memphis 21-7 off of the giveaways. The Pistons also finished with a 13-4 advantage in steals. Detroit found their shooting touch in the fourth quarter, connecting on 12-of-20 (5-10 3P) shots, while the Grizzlies got cold, shooting 5-for-19 (1-11 3P). An Andre Drummond putback as part of a 10-0 quarter-opening run trimmed the Grizzlies lead to single-digits at 79-71. 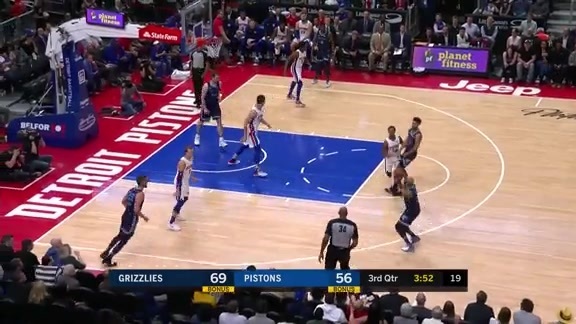 Former Grizzlies player Ish Smith would make back-to-back threes to give the Pistons the lead at 85-83 with 6:43 remaining, their first lead since scoring the opening bucket of the game. With Memphis trailing 93-89 with 1:05 left in the game, Tyler Dorsey earned a trip to the line, missing the first but making the second. After a Grizzlies timeout, Bruno Caboclo swished a three to narrow the Detroit lead to 95-93 with 50 seconds left, but Smith made a layup on the other end with 28 seconds to go, making it a two-possession game and putting the game out of reach. Delon Wright nearly finished with a double-double, scoring 15 points and grabbing nine rebounds. Wright is averaging 18.4 points and 8.8 rebounds in his last five games. Caboclo also had 15 points and blocked two shots. Caboclo has scored in double figures in six of his last eight games. Tyler Zeller finished with 13 points, six rebounds and three assists. Zeller has reached double-digits in all three of his games with Memphis. Dorsey chipped in with 12 points and four boards. Dorsey is averaging 14.3 points over his last 10 games. Memphis outshot Detroit overall, going 33-for-69 (10-24 3P) while the Pistons were 35-for-88 (10-34 3P). 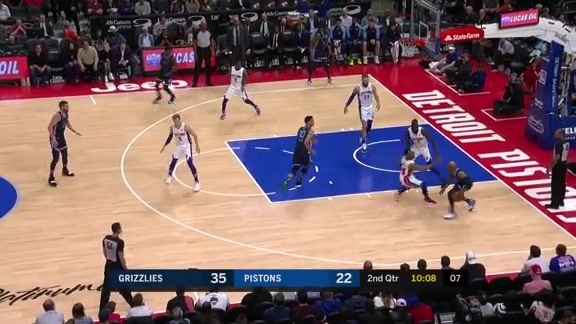 The Pistons doubled up the Grizzlies 14-7 on the offensive glass, but both teams finished with 15 second chance points. Memphis made an efficient 17-of-21 (.810) free throws throughout the game, while Detroit went 20-for-28 (.714) at the line. Drummond earned his league-leading 68th double-double, finishing with 20 points and 17 rebounds, five steals and three blocks. Smith tied his season-high with 22 points off the bench, scoring 13 of them in the fourth quarter. Luke Kennard added 15 points, making 5-of-9 (.556) three-pointers. Reggie Jackson chipped in with 12 points and five assists. 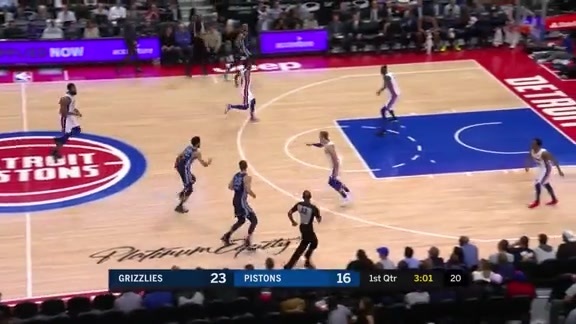 The Grizzlies’ issues with ball security resumed after halftime, committing seven turnovers in the third quarter, which led to 10 Pistons points. The Pistons used a 14-4 run midway through the quarter to cut the Grizzlies’ lead to 67-56, but the Grizzlies made 9-of-13 (.692) three-pointers in the quarter to carry a 79-64 lead going into the fourth. Memphis made most of their shots in the first half by going 21-for-37 (.568), which includes 8-for-11 (.727) from three, marking the best three-point percentage in any half this season. The Grizzlies’ defense limited the Pistons to just 15-of-47 (.319) shooting, including 4-for-19 (.211) from long range. Memphis – who entered tonight averaging 13.9 turnovers per game – already had 11 giveaways in the first half while Detroit committed four, but the Pistons only held a 6-4 edge in points off turnovers. No Grizzlies player had reached double figures in the half, but all nine that saw the floor scored at least four points. After starting the game 1-for-5 from the floor, Memphis finished 14-for-19 (.737) in the first quarter, setting a season-high for first-quarter field goal percentage and helping them jump out to a 32-20 lead. In the second quarter, the Grizzlies made 6-of-7 (.857) three-pointers, each one coming from a different Grizzlies player, to boost their lead to 57-38 at halftime. The Grizzlies wrap up the 2018-19 season when they host the Golden State Warriors on Wednesday, April 10 at 7 p.m. CT inside FedExForum. Wednesday night will also be the annual Fan Appreciation Night, presented by American Home Shield, which will include a variety of activities and performances throughout the night. Come out to the game, tune in to FOX Sports Southeast presented by Pinnacle Financial Partners or listen on 92.9 FM ESPN to follow the action. I thought our guys scrapped, I thought they competed, played with a lot of heart, a lot of effort. But, I think you saw a team in Detroit, especially in that fourth quarter, that was desperate. They turned up their pressure defensively, they got into us, they started denying some passing lanes. Give (Andre) Drummond a ton of credit, he was great in his pick-and-roll defense and the effort that he put forth on the offensive glass down the stretch. Give him a ton of credit for being a competitor and wanting to help his team continue to try to make a run to try to get into the playoffs. I thought our guys moved the ball really well. I thought we played in space. Defensively, I thought we were sound mixing up our zone back to our man. We did a good job on the glass in the first half and if you can do that in the zone and then get an opportunity to get out and run, you'll create some easy buckets, and I thought we did that. But in that second half, I think the defensive glass got away from us and that gave them extra opportunities, and again, I think that was the difference in the ball game. "You've got to give them a great job, they came out pressuring us, as we knew they would. They took us out of a lot of the things that we wanted to do in transition. Then we weren't able to get downhill the way we were in the first half." "Yeah and then I think everything was kind of free and easy for us in the first half. So I really felt better and made shots. In the second half, they did a great job. (Andre) Drummond had two steals that kind of really hurt. They got easy layups. So, they did a great job just coming out and pressuring us. We've just got to be better, come out, and make shots." Delon Wright and Bruno Caboclo led the Grizzlies in scoring with 15 points, each. It was Wright’s third game leading Memphis in scoring this season, while Caboclo has now done it twice. Ivan Rabb totaled nine points and a team-high 10 rebounds off the bench for Memphis. Rabb has amassed double-digit boards in five games on the year. Fans who want to support the Memphis Grizzlies and purchase tickets to the Grizzlies’ remaining contests may do so now by calling (901) 888-HOOP or going online to grizzlies.com. Single Game Tickets are available for purchase at the FedExForum Box Office, ticketmaster.com, online at grizzlies.com or by calling 1-800-4NBA-TIX. Sign up for Grizzlies E-News for the latest team news, promotions, contests and ticket offers delivered directly to your in-box. Join the conversation about the teams plus enjoy exclusive behind the scenes video and more.